Field coating services involve the coating of the girth welds produced on–site, at any onshore location, all over the world. We offer a wide range of coating systems and processes to cover the specific needs of our customers. EUPEC is renowned for its flexibility and our teams are highly skilled and adapted to life on-site. Our containerized equipment can be mobilized in a very short time, where a swift response is requested. It can be adapted to suit all climatic and on-site conditions. We integrate the latest technologies to optimize on-site performance in terms of cycle time and quality whilst respecting the environmental obligations. For horizontal drillings, our pre-equipped trucks allow application of coatings suitable for hard soil conditions such as PP flame spray applied system or fibreglass installation when required. 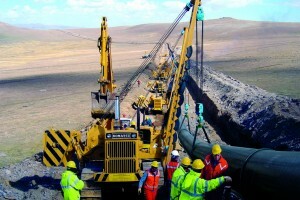 The main requirement of onshore field joints is the end-to-end anticorrosion protection of the landline. 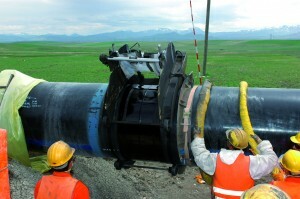 The field joint, or the bare part of the pipeline surrounding the weld area, is extremely sensitive to corrosion. The anticorrosion coating system includes surface preparation, induction heating and application of fusion-bonded epoxy and/or other single or multilayer anticorrosion products. 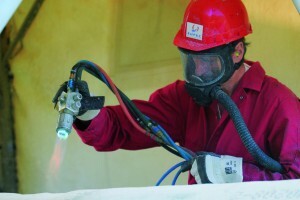 Our flame spray polyolefin process – polypropylene (PP) or polyethylene (PE) – combines the epoxies’ excellent chemical resistance and corrosion protection with the polypropylene’s mechanical protection and moisture barrier at elevated temperatures. Both PE and PP flame spray systems have been developed by EUPEC to fuse the parent coating with the applied joint at any coating thickness. EUPEC has a full range of spreads of polyurethane (PU) equipment which can be automatic or manual depending on the required production rate. This airless equipment is dedicated to the application of bi-component polyurethane systems with a proven track record in difficult and uneven topographies including slops of more than 20% and extreme weather conditions. Other types of mechanical protection are available such as heat shrinkable sleeves or cold tape, all of which comply with our rigorous in-house quality standards.